For a few weeks there, I had myself fooled. I had myself convinced beyond any doubt that this winter, there would be no snow. 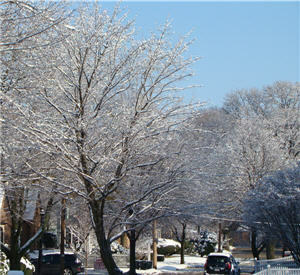 Though each increasingly light-shortened day would bring cold air, none would dump a heaping pile of snow on the city. These past few days in which close to a foot of snow has fallen in Boston, coupled with December’s massive blizzard, have fully shattered that illusion. I love snow; despite my twenty-something age, I still delight in the simple pleasure of beaning a friend on the nose with a snowball. It pains me to pray for clear weather in the winter but, as a year-round cyclist, I would rather forgo frozen frolicking in favor of clear streets. When I chose to live far from public transportation, I too chose to bike to work, to the store, and elsewhere, no matter what sort of terrible conditions I ran into. Now, though, I’m beginning t reevaluate that decision. Riding a bike in a snowstorm is something like trying to cross the length of a large gymnasium by hopping from one basketball to another, in parts on only one foot, and at all times with a stack of three hard piled eggs—piled one on top of the other—balanced atop your head; at no point do you feel safe, instead enduring a constant fear that you are about to eat it big time, and, embarrassingly, in front of a lot of people. Remaining upright on only two thin, slick tires is something of a Sisyphean task. At least Sisyphus didn’t have maniacal drivers zipping along behind him, set to run him down each time he stumbled and fell. While I ride in constant fear of the total lack of traction, I fear even more the collateral damage caused by sloppy roads. Slush and sand and salt, kicked back from both tires, soaks the back of my pant legs from ankle to waist, with the most damage conspicuously showing in the seat. The damp, cold fabric clings to bare skin; water soaks through even underwear. Even once dried, anything sprayed with road slush is tinted a grimy, gritty brown. After a long ride, it looks as if someone has run a brown paint roller straight down my back. Attempts to wipe off the stains—with specific attention being paid to the backside, as a brown streak here is, understandably, particularly embarrassing—result in the stain persistently hanging tough, while the sand falls freely about the house, evenly coating the floors and furniture in a few inches of grit, with even greater accumulation coming days later between my sheets as sand is tracked foot-load by foot-load into bed. Add to all this the damage wrought on a bike frame and all its components by the constant abuse of corrosive salt and teensy, bearing-penetrating sand particles. In one ride, a fresh, oiled bike can wind up looking—and running—like it’s just been dragged through a swamp. And yet, I chose to live where I live, knowing that I’d be biking another year through in terrible New England weather. Maybe it’s a subconscious desire to make a statement, to prove that clean transportation options are available, even in such inclement conditions. Maybe I’m just crazy, biking in blizzards when even SUVs are sliding sideways into curbs. Whatever the reason, I’m ready to buckle down, persevere, and stick it out on my bike for the remainder of the winter. Every morning as I ride to work, I see the drivers around me rolling in climate controlled comfort. Envious, I pedal on and say a silent prayer for a heated bike seat or, assuming one isn’t invented yet, a thicker pair of gloves. It’s shaping up to be a long, cold winter this year, but I’m up to the challenge.